NOTE Magazine Spring 2019 Issue Launches! Indianapolis has a robust local classical music scene, worthy of being treasured as one of our city’s defining assets. 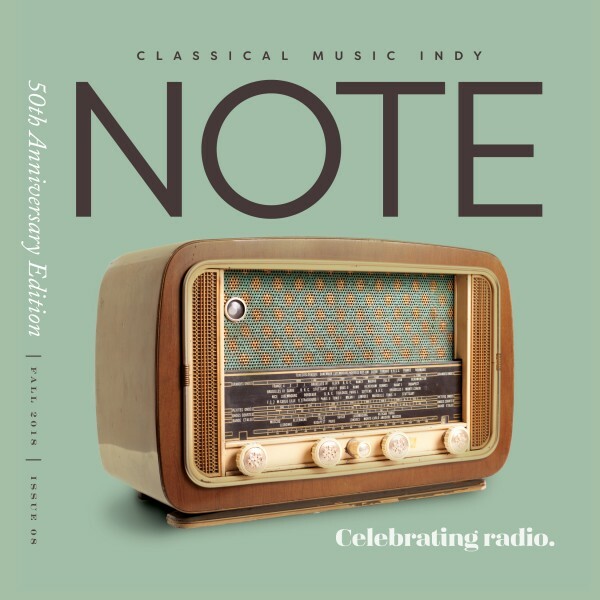 And with NOTE, Classical Music Indy aims to tell stories that will delight and surprise avid classical fans, as well as welcome those new to the world of classical music. For our Spring 2019 issue, we chose to highlight one of the most intriguing topics in the medical field: music and the brain. We cover one of the most intriguing topics in this issue of NOTE that has Medical Doctors working with Musicians! Read about Indianapolis composer Stuart Hyatt, and see how music influences the brain. Indianapolis has a robust classical music scene, worthy of being treasured as one of our city’s defining assets. For just $25, get a year's worth of NOTE delivered to your door! Looking for a NOTE-worthy gift? For just $25, give a classical music fan a gift subscription to NOTE magazine, and share the best in local classical music connections for a full year. Get in the holiday spirit with this issue of NOTE, which shares how classical music gives back to its community in unexpected ways. Take a journey with Unsilent Night, the international boombox caroling music phenomenon. To celebrate Classical Music Indy’s 50th anniversary, we pay homage to the most consumed media in the U.S.: Radio. Learn how our founders kept classical music on the air in Indianapolis and discover a spirited way to toast 50 years. To relaunch NOTE magazine, we chose to feature Women in Music, to celebrate local influencers past and present that have made stunning accomplishments not only with their talent, but also with their leadership in the genre.